When President-elect Donald Trump named Alabama Sen. Jeff Sessions as his choice for attorney general, he settled on a candidate who very much fits the professional profile of past Justice Department leaders. 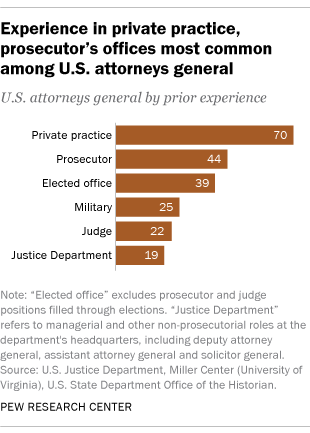 Like Sessions, dozens of the 83 people who have served as U.S. attorney general previously held positions as prosecutors, elected officials and attorneys in private practice. And, like Sessions, all but four were non-Hispanic white men. 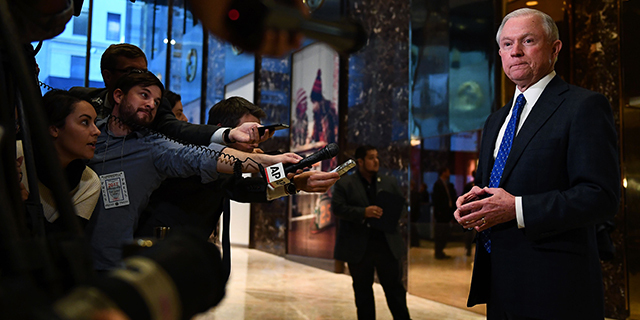 Sessions, however, stands apart from current and past attorneys general in his geographic background and education, according to a Pew Research Center analysis of biographical information from the Justice Department and other sources. Born in Selma, he would be the first attorney general from Alabama and just the fifth from the Deep South (which we define as Alabama, Georgia, Louisiana, Mississippi, North Carolina and South Carolina). It bears noting that current Attorney General Loretta Lynch is also from the Deep South; she was born in North Carolina. 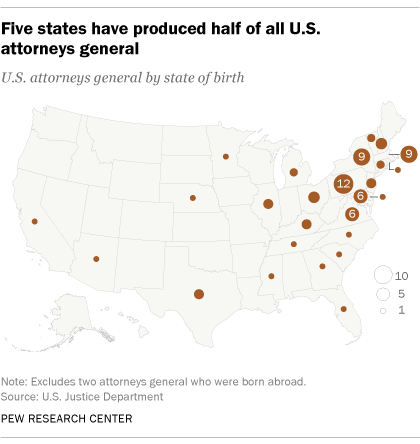 By contrast, more than half of all attorneys general to date (42) have come from just five states: A dozen were born in Pennsylvania, nine each were born in Massachusetts and New York, and six each were born in Maryland and Virginia. Sessions earned his bachelor’s and law degrees from Huntingdon College and the University of Alabama, respectively. By contrast, each of the past 10 attorneys general (including Lynch) earned at least one degree from an Ivy League institution. All 10, in fact, earned at least one degree from one of just three Ivy League schools: Columbia, Harvard or Yale. Otherwise, demographically and professionally, Sessions looks very similar to past attorneys general. Sessions’ confirmation would mark a return to an overwhelming history of white male attorneys general after a recent period of racial, ethnic and gender diversity atop the Justice Department. Four of the past six attorneys general broke demographic barriers: Janet Reno became the first woman to lead the department in 1993; Alberto Gonzales became the first Hispanic in 2005; Eric Holder became the first black in 2009; and Lynch became the first black woman in 2015. Sessions would join at least 39 other attorneys general who had been elected to some position other than to a prosecutorial job. (We also excluded judicial positions filled through elections.) The last U.S. senator to become attorney general was John Ashcroft of Missouri in 2001. Having served in the U.S. Army Reserve from 1973 to 1986, Sessions would join at least 25 attorneys general with military experience. But the most common professional thread that ties together attorneys general is private law experience. Beginning with the first attorney general – Edmund Jennings Randolph in 1789 – at least 70 previously served as lawyers in private practice. Sessions, who practiced law in Russellville, Alabama, early in his career, would become the 71st.